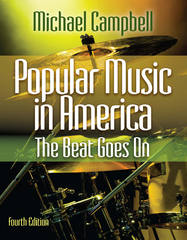 Popular Music in America 4 Edition Michael Campbell's best-selling POPULAR MUSIC IN AMERICA, now in its fourth edition, remains the industry standard in breadth of coverage, readability, and musical focus. The text provides a rich account of the evolution of popular music from the mid-19th century to the present. Discussions highlight connections, contrasts, and patterns of influence among artists, styles, and eras. Coverage of listening skills allows students to place music of their choice in context. The Fourth Edition expands the coverage of country, Latin, world, and late 20th century music to give instructors more options to teach the course as they choose to. A major reorganization replaces long chapters with units broken into small chapters to make the material easier for students to read and master. Units are clearly defined by style and timeframe, and chapters feature narrowly focused objectives. This edition features a vibrant, richly illustrated, magazine-like design, plus numerous online resources. Almost all listening examples are available on iTunes via dedicated playlists; instructors who adopt the text will also receives copies of the "heritage 3-CD set" from the 3rd edition for personal, library, and class use.